Drama students at The Sixth Form College, Solihull performed in two Drama Showcases entitled ‘Living the Part’ this week as they showed off their assessed practicals. 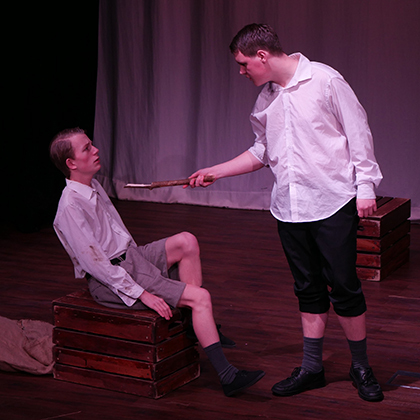 The A level Drama & Theatre students produced performances of between 5-15 minutes in length, showing their interpretation of challenging theatre productions. These productions included extracts from ‘My Mother Said I Never Should’ by Charlotte Keatley, ‘Death and the Maiden’ by Ariel Dorfman, ‘The Crucible’ by Arthur Miller, ‘The Collector’ by Mark Healey, ‘Miss Julie’ by August Strindberg, ‘Top Girls’ by Caryl Churchill, ‘Be My Baby’ by Amanda Whittington, ‘The Glass Menagerie’ by Tennessee Williams, ‘Blue Remembered Hills’ by Dennis Potter and ‘Steaming’ by Nell Dunn. 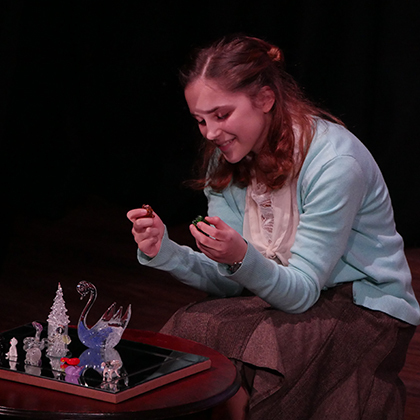 A celebration of the breadth of the realistic theatre style, these showcases featured several groups of first year students performing duologues and trios. These were the pieces they are being assessed on and performing in front of an audience was excellent preparation for that assessment. College students are fortunate enough to use three professionally-equipped studios for rehearsal and staging finished work and get plenty of support from our dedicated and experienced Drama staff, who are always extending students learning with additional trips and workshops to contemporary theatre practitioners.